Lauren B. • This entry was posted in Fashion, OOTD and tagged bunny watch, Cardigans, floral shoes, GYPO Style Challenge, ModCloth, OOTD. Bookmark the permalink. I would have passed right over that striped cardigan because of the brown in it–never in a million years would I have thought to wear it with a gray tee. And now I LOVE it! 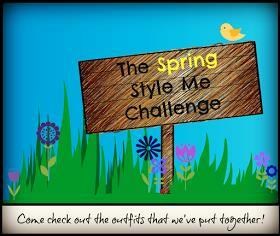 You are a style goddess and always love to see what you come up with! Awwwwwwww!!!!!!!! That made my day, Denise! You always have the most sweetest and encouraging things to say. I was a little scared to pair the cardi with grey, but I was really surprised with the results! The cardi is SUPER soft, too. It’s a great find. you and your mom are the cutest! I LOVE your striped cardi and as always, all of your accessories. Really great looks, Lauren! Love the striped cardigan. Thank you, Carrie! It’s so comfy. I highly recommend it! Didn’t we have fun on Saturday? Total girls’ day out and in. Just love being with you and can’t wait til we can live closer to one another. I like both looks very much but that Froyo cardi is just delicious and so refreshing. So glad you put the yellow bag with it and the mint accessories. Just perfect. I love you! Your mom is so sweet and awesome, and I’m glad she introduced us to you! I love both of your outfits, and really like all the “purchasing” suggestions – although I must stop shopping! You look lovely! You and your mom are so cute! Love these 2 outfits! Cute outfits! I’m loving all your turquoise necklace finds. Hi there! Thanks so much for the sweet note!!! I will definitely check out your blog… Subscribing right now! Love you ladies!!! Cute!! Cute!! That is an awesome cardi!! Also, I need more cobalt blue accessories in my life! !